Jhn 20:23 Whosoever sins ye remit, they are remitted unto them; and whosoever sins ye retain, they are retained. This Subject is about getting the MIND of CHRIST. God is not Judging anyone’s Sin. Jesus did not even address anyone’s sins, he just Healed people, and said Sin know more. Then Jesus tells us we can remit sin, yet go's on to say if you do not forgive men their Trespasses, neither will God forgive yours. So here is what is Called a Caught 22, where you had better forget about the whole thing, since the minute you want to talk about someone else's Sin's, or any Degree or issue about it, This Puts the SPOTLIGHT FOCUSED BACK ON YOU. In This Verse JESUS gives his BODY POWER to FORGIVE or retain the sins of others? The Word remitted, means the same as forgiven; HOWEVER, then he goes on to say this. If you are Now Retaining the Sins of others, then God is retaining your Sins? WOW! JESUS was forgiving others their Sins, before he ever went to the CROSS. He did not even ask them to Repent. He FORGAVE their Sins, and Healed them? Luk 5:23 Whether is easier, to say, Thy sins be forgiven thee; or to say, Rise up and walk? This is Our EXAMPLE on the SUBJECT of Forgiving SIN. We REMIT all Sin, unless you want to Retain your own? JUDGEMENT has been Given to the SAINTS (the Son of Man). Jhn 8:15 Ye judge after the flesh; I judge no man. Jhn 5:19 Then answered Jesus and said unto them, Verily, verily, I say unto you, The Son can do nothing of himself, but what he seeth the Father do: for what things soever he doeth, these also doeth the Son likewise. So if GOD IS NOT Judging anyone, why would the SON? since the SON can only do what he see's the Father doing? JESUS is Judging know one. But the WORD of GOD will be the JUDGE. Jhn 12:48 He that rejecteth me, and receiveth not my words, hath one that judgeth him: the word that I have spoken, the same shall judge him in the last day. 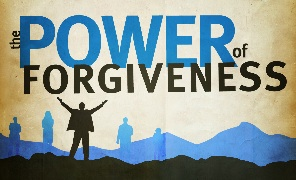 THE TRUE SON'S OF GOD ARE THOSE ACTING on the POWER to FORGIVE. YES, THIS is Our POWER. This is a GODLY Attribute we can all Copy. SIN has been PAID FOR. It was an UNPAID BILL that JESUS took care of. How can you keep trying to get someone to Pay for something that was ALREADY PAID FOR IN FULL???? Do you keep paying Bill collectors who ask you to Pay a Bill you already Paid for? STOP TALKING ABOUT SIN. IT WAS FINISHED 2,000 years ago, and GOD is DONE WITH IT. JUDGEMENT is for the Unrighteous, or never been Born again, and Fallen Angels.